Patient Lifts such as Hoyer Lifts and Sit-to-Stand Lifts are available to rent at Independently Yours Medical Supplies in Louisville, CO. Hoyer Lifts and Sit-to-Stand lifts are designed to make transferring and lifting people from beds, wheelchairs, chairs, couches and toilets significantly easier and less painful on the caregiver and patient. 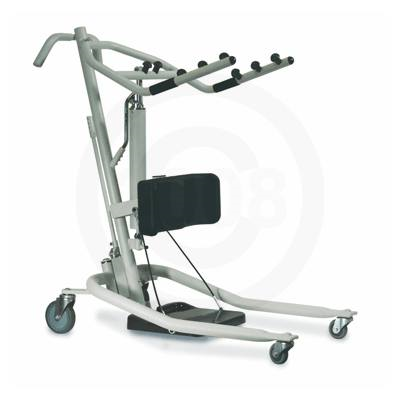 The hoyer lift allows a caregiver to move the patient with no assistance from the patient, or requiring them to stand at all. The Sit-to-Stand helps lift a person out of a bed, wheelchair, couch, chair or toilet while requiring some assistance from the patient as they will be placing weight on their legs when they are lifted up, leaning on a sling. Boulder patient lift rentals are rented weekly and monthly at affordable rates and include delivery and pickup to Boulder, Louisville, Superior, Erie, Broomfield, Arvada, Westminster, Commerce City, Denver, Thornton, Longmont, Brighton, Golden and Wheatridge. Slings for the rental lifts are not included in the rental, and are for purchase only for sanitary reasons. Call us today to schedule your Hoyer Lift or Sit-to-Stand rental.